Increase attention in the community of Sault Ste. Marie to the importance of mental health programs in assisting its members to live healthier lives. Enhance communication in the community of Sault Ste. Marie to the benefits of maintaining our individual mental health. 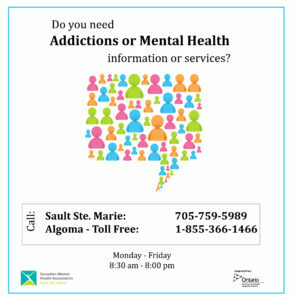 Promote the local mental health programs and their benefits to Sault Ste. Marie and surrounding area. Reinforce the need for continued support of mental health programs. Provide social support to our local mental health programs through more open communication within the community about the importance of mental health while increasing financial support from the community allowing these programs to continue to educate and assist with the possibility to increase the number of people reached by the programs. Click here to visit the Grab Hold Fashion Gala Facebook page! Tickets are now on sale at The Machine Shop box office.